Argan oil has been deemed worthy of being called “liquid gold” amongst beauty professionals. You may be familiar with its applications in hair care products or moisturizers, but argan oil’s properties are wide ranging. Our founder discovered a culinary grade argan oil sourced by our wellness partner Victoria Akkari in late 2017. Executive Chef Serafina describes the flavor as “toasted and nutty, almost similar to walnut oil but richer.” In addition to its distinct taste, argan oil is a nutrient-rich beauty food. We fell in love upon discovery and feature it regularly on our meal delivery menu. To share more details on this unique ingredient, we checked in with Victoria. Where does Argan oil originate and what is the difference between culinary and cosmetic grade oils? Argan oil has been used in Morocco for centuries for medicinal purposes and as a staple ingredient with the North African Berber tribe. It comes from the fruit of the argan tree, also known as Argania spinosa, which is native to the southwestern region of Morocco. The oil is extracted exclusively from the kernels of the fruit by lightly roasting. This creates the edible oil, and produces a delicious nutty flavor. Without roasting the kernels, this oil is used strictly for cosmetics. What impact on the environment and local communities of Morocco does the oil have? On an environmental level, the argan tree is very beneficial. The deep roots of the tree prevent desertification. Since its roots travel so far down, they stabilize the soil of the Sahara from encroaching upon Morocco. Argan oil also provides women in Morocco with jobs, which is critical in a region where there are few opportunities for them. This helps preserve the traditional method of argan oil production, where the nut is cracked between two stones and hand-extracted, ground, and kneaded by hand to produce the oil. This is another reason why argan oil is so valuable. It’s important that your argan oil is sustainably fair-trade sourced. What are the health benefits of argan oil? 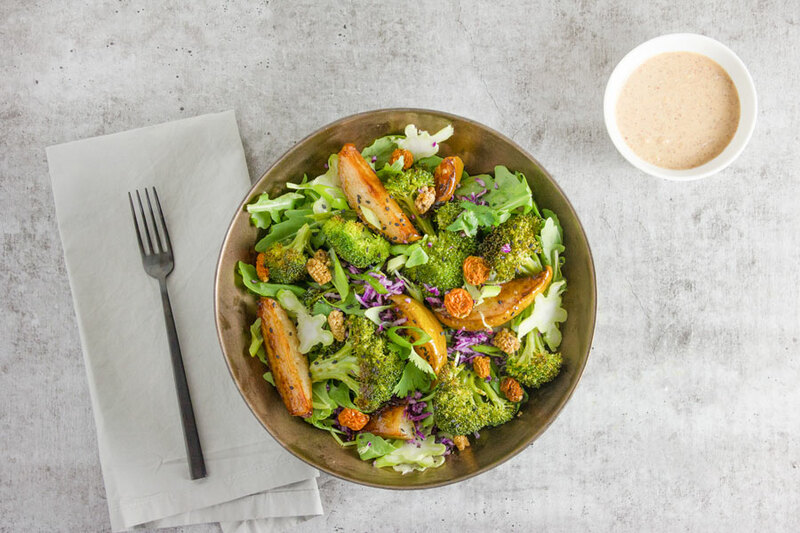 Our chef designed this Roasted Pear and Broccoli Salad featuring a Ginger Almond Argan Oil Dressing. Our philosophy is simple. When you eat real, high quality, nutrient-dense foods, you feel better and look better. US Weekly’s Beauty editor said our meals had “dramatic impacts on her skin.” We’re all about supporting beauty from the inside out and it all starts with how you nourish yourself. A midwest native, foodie at heart, and lover of travel led her to Morocco where she says “argan oil discovered her”. With a formal background in jewelry design from Parson's School of Design and The Fashion Institute of Technology she is now a small-batch food artisan working with a women's cooperative in Morocco to bring Argan Oil to select markets in the US. Her best and go-to advice - always follow your heart.